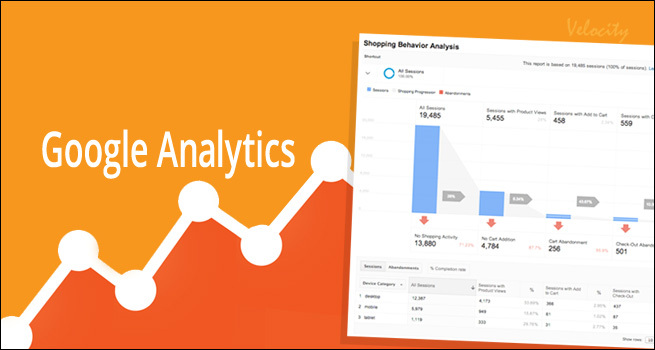 The enhanced eCommerce plugin for Google analytics measures the overall interaction of user with different products on website including user shopping experience- product clicks, adding product to the cart, initiating checkout process, viewing product details and so on. 1.1 How is eCommerce tracking different from enhanced eCommerce? eCommerce tracking in Google analytics allows you to evaluate the number of transactions and revenue that your website generates. On any eCommerce website, once a user clicks the purchase button in the browser, the information is immediately sent to the server which further processes the transaction. Once the purchase gets successful, the server directs users to a confirmation or “Thank You” page. Enhanced eCommerce tracking comes with the presentation of new reports in Google Analytics interface. Whether it’s about tracking sales funnel, affiliate marketing, shopping cart behaviour or anything related to shopping cart or product management, eCommerce tracking is a must for any eCommerce site. 1.2 Enhanced eCommerce vs. eCommerce Google Analytics- See the Difference!! The major difference which makes enhanced eCommerce tracking better and advanced over eCommerce Google analytics is that in enhanced eCommerce tracking, you will be able to monitor the entire life cycle of customer behavior right from visiting the store to completing a purchase. In old eCommerce data analytics, you were able to track data only after a transaction took place. There was no scope of monitoring customers before the purchase. 2.1 Shopping Behavior- The reports on shopping analysis gives online store owners a look at how visitors engage while viewing products, adding or removing items from cart, carrying out transaction, abandoning the cart. After viewing these reports, eCommerce store owners can form hypothesis and begin testing to maximize user engagement and conversions on their site. Besides evaluating product performance reports, online retailers can also evaluate how well are the marketing plans working. The affiliate marketing report lets you track the number of sales revenue, transactions and average order value as they are a part of affiliate marketing. Promotional coupon report gives you an idea to see how effective product-level coupons are in terms of increasing revenue and purchases. In case of internal promotions, you can track the number of clicks and CTR (Click-through rate) for that specific promotion. Enhanced eCommerce tracking is about mapping the overall journey of a customer. It went from using information on the purchase confirmation page to analyzing the overall process from end to end. With its help eCommerce store owners can now manage and improve their website into conversion making tools. Enhanced eCommerce tracking makes it easier for users to collect data about how consumers behave on their sites. Enhanced eCommerce is currently operating in beta mode and Google is likely to roll out the complete version along with added features.